FFF (fused filament fabrication) is the most spread technology for low end 3D printers. They work like glue gun. The stl data format is well supported for 3D printers and 3D printing software. The stl format is converted in CNC machine instructions the G codes by a slicer program. In this process the 3D model is converted into a set of 2D slices. The G codes finally tell the machine how to move within a slice. This conversion also allows to decide how the inside of a figure is structured as make honeycomb to save material and increase plotting speed. To be flexible 3D printers as from the open source community http://reprap.org/wiki/RepRap have everything openly published and therefore open to evolution and improvements. They do not sell directly products but they provide many links. 3D printing PC SW is mainly used to convert the stl format to G-code. It is not recommended to have the printer doing this, since this quite complex task and the PC is a much better platform to have SW updates for it and fine tune the parameters. The object must be able to stand. Furthermore it must be able to glue to the heated bed. Overhang printing works just to a certain degree. A way out is printing support elements that can be removed when finished. Usually the 3D printer SW takes care about everything, but it comes with many parameters. So when the result does not satisfy, the parameters can be adjusted. It is a common habit that there is a z-axis offset between printing software and printer. Moving the extruder home means moving it to 0 and nobody wants that it scratched and damages the bed while doing this. A good adjustment makes that a small distance between bed and nozzle can be seen and a feeler gauge of 0.1mm does not pass. 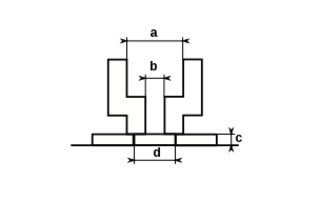 This means the z-axis offset is between 0 and minus 0.1mm. Add then -0.1mm to the slicer software for the z-axis offset. Since the real distance is smaller than 0.1mm it gives a bit fatter first ayer and compensated leveling tolerances. Since the printer can not go below that, the fist layer must be equal or thicker than this offset. Extruder diameter (b) has a secondary role in printing. More important is (c) the height the nozzle is above the bed (for the first layer). Therefore it is important that the bed is flat and leveled. Automatic leveling can help here. Obviously (b) and (c) have some relation ship. (c) should be around half (b), so for a 0.35mm nozzle the layer height should be around 0.15, and this give also a requirement on the flatness of the bed and its leveling. A good fat first layer or automatic bed leveling are therefor vital to get good results. Filament diameter (a). For fine tuning reason the filament diameter (a) can be measured, since it might not be 3mm it might be 2.9mm (3% less diameter => 7% less area or volume per second). Measuring the filament diameter and adjusting it in the slicer parameters is therefore advisable. Speed of filament going into the extruder (v). This is set by the speed of the extruder motor. The motor speed can be set precisely. A hobbled wheel is usually used to move the filament. The radius of this the hobbled wheel is therefore also crucial. However the real radius is the radius of the filament center to the center of the hobbled wheel. A delay between in and out exists since the filament must first be put under pressure before it flows. And it flows just if it is melted. The extruder can loose some steps when the material is not liquid enough or on too much pressure. The filament volume per second will then be squeezed onto the surface. The profile has the height of the extruder above the surface (c = layer height) and the width (d) results out of the volume per second and the speed the surface moves below extruder (vs). Squeezing the material onto the surface results in some force between surface and material and results into a rather rectangular string. The final result is that the material attaches well on the surface. Putting material in a rather circle shape on the surface will not produce any force between surface and the material and might therefore not attach. Considering the shape rectangular (d >> c), the volume per second on the surface is c*d*vs. This is the same as what coming from the extruder. Therefore the width (d) is d=(a2*pi*v)/(c*vs). Reducing the layer height gives better results but also increases the time to print. It is therefore a good parameter to be modified. Example: Cut the printing time to approximately half increasing the layer height from 0.1mm to 0.2mm and accept a minor print quality. Filament diameter 1.75mm that is used on the more modern printers and 3mm is one option. This is more an extruder issue. Material goes to the extrude and needs to be melted. 3mm has therefore less speed but needs to melt a higher diameter it is therefore slower and needs more extruder force. 1.75mm is faster and has a better response time.